Casa Padrino, your specialist furniture retailer, offers a sumptuous collection of exceptional and trendy bar stools. The entire range of our gastronomy furniture and decorations category is excellently suited for customers in the gastronomy sector, the hotel sector, for industrial companies, for professionals, for freelancers and for public institutions. A bar stool from our collection differs from a normal dining chair primarily in the seat height. For a bar stool, the seat height is usually about 15 cm higher than in a conventional kitchen chair. We also promise you that our barstools will give you and your guests a pleasant sitting experience. This is ensured by comfortable seats made of wood, metal and plastic, which are often additionally provided with a soft cushion. 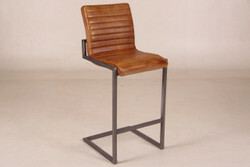 All bar stools in our range are made of high quality materials that have been superbly processed. Because the bar stools should give you a very long-lasting pleasure. Therefore, our bar stools from the base to the seat are mostly made of sturdy solid wood, which is partly stained, such as beech, pine, teak or oak; Metal such as steel and stainless steel, which is often chrome or brushed, or durable plastics. In addition to the wide range of immediately available furniture, Casa Padrino also offers you the possibility of furnishing furniture in all styles, such as to make the baroque style according to customer requirements and deliver it promptly on favorable terms to you. For further information about the complete offer just call us on + 49-201-36577485 and our qualified support will help you in every detail! Guaranteed! Casa Padrino, your baroque wholesale on the internet and on site.